We are the largest, independent China-UK professionals’ membership network. We are a unique and trusted platform for business, educational and cultural services. China is moving up the value chain and now focusses on home-grown innovation. It is a world leader in solar energy and high speed rail and is the world's largest manufacturing nation. The needs of our members are diverse and China’s evolution is swift. We are a one-stop shop delivering a portfolio of quality services that provide solutions. From China skills recruitment, business and cultural insight, in-market support, specialist travel itineraries and access to a unique network, see how we can help you. The Club comprises an exclusive and elite network of 4,000 professionals working across China and the UK. 50% are from mainland China and 95% speak Mandarin. Founded in 1993, inspired by Rupert Hoogewerf, Chairman of Hurun Report and Godfather of China’s Rich List, our membership covers all industry sectors delivering enviable ‘guanxi’. 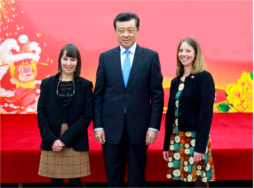 Providing a valuable China-UK interface long before China established itself as a global power, it is no surprise that we have an excellent reputation in both business and government circles. Our loyal membership grows through word-of-mouth. We aim for the highest of standards and our excellent track record speaks for itself. We genuinely care about our members and are delighted to have created a family of professionals. Our personal and collaborative style provides a unique space for like-minded Chinese & British professionals to network. We understand that relationships matter in business - particularly when working cross-culturally. We look forward to welcoming you to our Club.